* Please Note: This cement contains sodium silicate. It should not be used without safety goggles and chemical-resistant gloves. 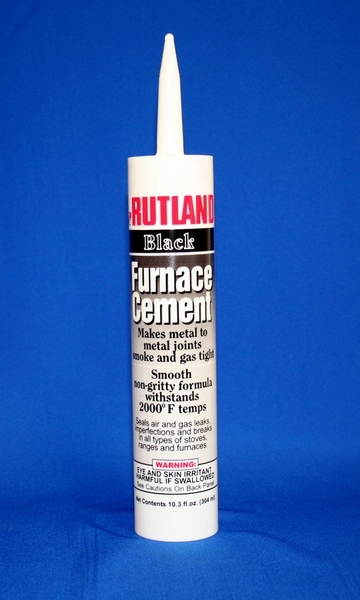 Rutland presents the best all-purpose furnace cement adhesive that effectively creates metal-to-metal and metal-to-masonry joints that you can be assured is smoke tight, airtight and inviolable. This adhesive can withstand temperatures of up to 2,000F and can effectively cement 1/8" wide metal-to-metal and metal-to-masonry joints. Suitable for use on cast iron materials, steel and firebrick, this adhesive is toxic-fume free and able to conveniently fit in a standard caulking gun. Note: This furnace cement contains sodium silicate. It should not be used without safety goggles and chemical-resistant gloves. Note: This furnace cement contains sodium silicate. It should not be used without safety goggles and chemical-resistant gloves. How long does it take to properly cure once the 500* has been reached? It is recommended that it cures for one hour. How long can I wait to heat cure the cement? Can it wait a week or maybe two weeks? It is always recommended to cure the product as soon as possible after the application, as this ensures maximum durability. Will this harden once I heat cure it or do I need to reapply a new coating after rain? The product will indeed fully cure and harden once subjected to the 500 degree cure temperature for at least 1 hour. It is always recommended to cure the product as soon after application as possible, as this ensures maximum durability. Can this product be used to seal around an insert face of a gas fire place? This product is best used for wood burning applications only, as it has a high cure temperature of 500 degrees that may not be achieved by a gas insert. Can I use this to repair a firebox in a Big Green Egg style Kamado? This product would be ideal for repairing small cracks in that sort of application. Can I use this to fill a narrow crack between the metal top and sides of my wood stove? Will this expand or contract when my wood stove heats up and cools down? This product is indeed designed to repair wood burning stoves. It will flex with your stove as it expands and contracts. I used this product to reseal my wood stove. I used the product as instructed and it worked as advertised. I've used the stove half a dozen times and the cement is holding up well so far.